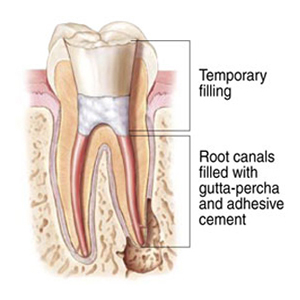 Endodontic or "root canal" treatment is necessary when the pulp becomes inflamed or infected. The inflammation or infection can have a variety of causes such as trauma, decay, a crack or chip in the tooth or a deep filling. If this inflammation or infection is left untreated, it can cause severe pain or lead to an abscess. Signs of pulp damage include pain, sensitivity to heat or cold and swelling or soreness of the gums. Sometimes, there are no symptoms. Root canal treatment is usually performed in one or two visits. Plan for each appointment to last approximately 1 ½ hours. While your friends & family are welcome to wait for you in our waiting room, our exam & treatment rooms are unable to accommodate family members. Also, small children will need to be accompanied by an adult during their wait. As with most simple dental procedures, you may drive yourself home and in most cases you may return to work or school following your appointment(s). Prior to root canal treatment, local anesthetic is used to numb the tooth and the surrounding area. After the tooth is numb, a protective cover called a "rubber dam" is placed over the area to isolate the tooth and keep in clean and free of saliva during the procedure. An opening is made in the crown of the tooth. Very small instruments are used to remove the pulp from the canals and to clean and shape the space for filling. After the space has been cleaned and shaped, the root canals are filled with a rubber-like material called "gutta percha". Last, a temporary filling is placed in the tooth to close the opening. When the root canal is completed, you must return to your general dentist to have a crown or other restoration placed on the tooth to protect and restore it to full function. With modern technology, most patients report that they are comfortable during this procedure. It is possible for you to experience mild to moderate discomfort for the first few days after treatment. This can be relieved with over-the-counter or prescription medications. Detailed post-operative instructions will be reviewed with you to help you with your at-home care. With proper care, your teeth that have received endodontic treatment will last as long as natural teeth. However, occasionally teeth may not heal properly and pain may continue to exist. If you are still experiencing pain from your endodontic treatment several months or even year after your initial procedure, retreatment may be required. Typically a root canal can be used to fix injured teeth, but in certain circumstances a surgical procedure is needed. An apicoectomy is a simple procedure that involves an incision in the gum tissue to expose the bone surrounding any inflamed tissue. During this procedure, the damaged tissue is removed along with the end of the root. A filling is put in its place to prevent infection. Cracked teeth can cause many problems including pain, temperature sensitivities, and chewing difficulties. There are 5 different types of cracks including craze lines, fractured cusp, cracked tooth, split tooth, and a vertical root fracture. If the problem is not fixed, the pulp could become damaged and the tooth will consistently hurt. Cracks can also lead to infection which can potentially lead to bone and gum infection. Common traumatic tooth injuries include dislodged teeth, avulsed teeth, and injuries in children. Injuries to the mouth can cause teeth to be pushed back into their sockets or partially out of their sockets. Additionally, teeth can be completely knocked out of the mouth and it is important to receive treatment immediately. 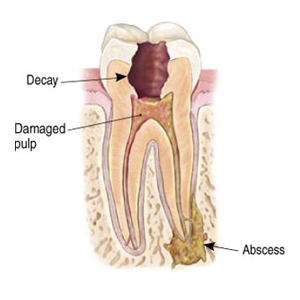 An injured immature tooth in children may need one of two surgeries including apexogenesis or apexification in which the root is encouraged to continue to grow or the unhealthy pulp is completely removed.